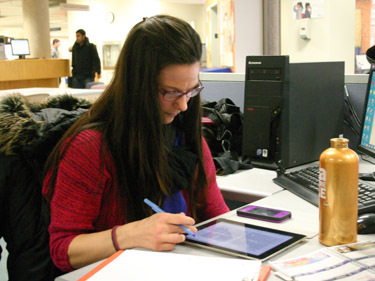 A group of Nova Scotia university libraries is testing a new approach to ebook lending that offers unprecedented levels of access to students and faculty. Novanet – a consortium of 10 academic libraries founded in 1988 – has negotiated a new deal with publishers to allow the sharing of electronic books among libraries as freely as the sharing of print books. In a pilot project that began in November, the member libraries deposited a total of $100,000 to access a shared collection of about 16,000 ebooks through vendor EBL. Patrons of any of the 10 libraries can instantly access these books through the Novanet system. The agreement represents something of a breakthrough for academic libraries in North America, says Novanet manager Bill Slauenwhite. Ebooks are praised for their convenience, but their use in libraries has actually been more restricted than print books due to licensing agreements. While a consortium such as Novanet could purchase a single print book and share it among all its libraries, it had to pay a “multiplier” of about four times the face value of the book to enjoy the same privileges with an electronic copy. Member libraries were rarely willing to pay the extra cost. In the past, this has meant that library patrons could view, but not access, listings of ebooks owned by other universities – a frustrating experience for users, and one Slauenwhite says goes against Novanet’s core value of shared access. Novanet and other consortia have been attempting for years to convince publishers to allow shared access without charging a price multiplier. The new agreement marks Novanet’s first success at that goal. According to EBL vice-president of sales and marketing David Swords, Novanet is the first of EBL’s global clients to use this model. 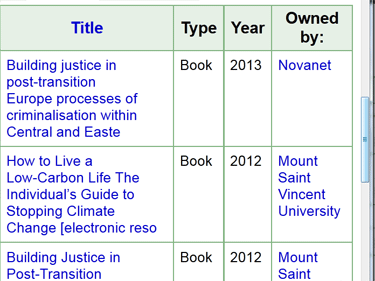 Ebook records marked “Owned by: Novanet” can be accessed by patrons of all Novanet libraries instead of just one. Image taken from Novanet. Mixed in with the nearly three million records of the full Novanet database, the pilot project’s 16,000 ebooks aren’t likely to immediately affect the average user. Of a dozen students polled for this story at Dalhousie and Mount Saint Vincent universities, none had noticed the change. That’s not a problem, says collections librarian Ian Colford of Dalhousie, one of the partner universities. Ideally, the system should be seamless and invisible. Some regular library patrons were pleased with the improved ebook access upon learning about it. Novanet will evaluate the pilot project’s success about one year from now. Books offered under the Novanet Ebook Pilot provide a similar user experience to that of the OverDrive system used by Halifax Public Libraries. Since 2008, that system has allowed public library patrons access to ebooks no matter which of the 15 branches they belong to. But university libraries work under a different licensing agreement that allows multiple concurrent readers of a title, unlike the public library’s restriction to one user at a time. Universities also must deal with academic publishers, who operate in a much narrower market than mainstream publishers. These differences have made academic publishers reluctant until now to allow sharing of ebooks between libraries. Acadia University is also participating in this ebook pilot project. I’m so interested in this news! Could you possibly send the names of 28 publishers which are participating to this deal to my personal email address?